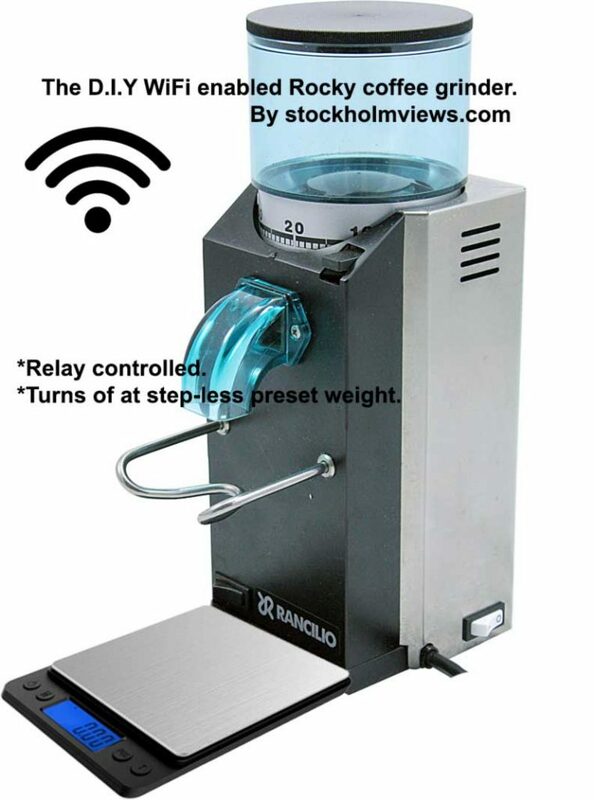 I have finally starting to reach my goal to modify a Rancilio Rocky coffee grinder to become a smart grinder . The glas will rest on the scale and scale tare’d before each grinding session . Description of my grinder mod. My grinder will have the following features when completely modified. A smart scale that grind and then turns off the grinder at a preset weight. 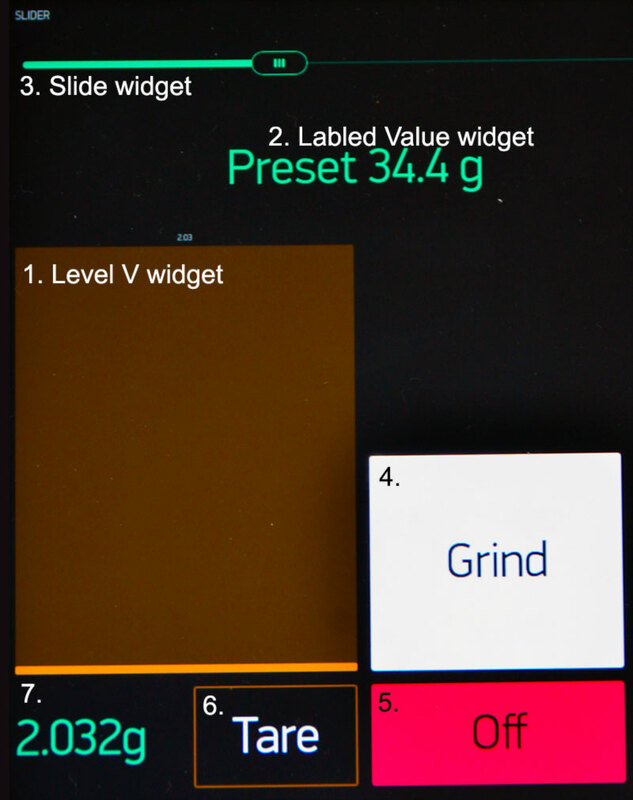 A app to turn the coffee grinder on and off and that allow me to step-less adjustments of the preset for the final weight of grinding session. A way to step-less adjustments of coffee grain size from the app and maybe also some presets (adjustable) like Espresso, French-press, Drip etc. the first ones above are already implemented, the italics are not! For coding the ESP8266 (I mostly use dev units like WeMos D1 Mini) i have chosen Arduino IDE that are popular and quite easy to get started with. 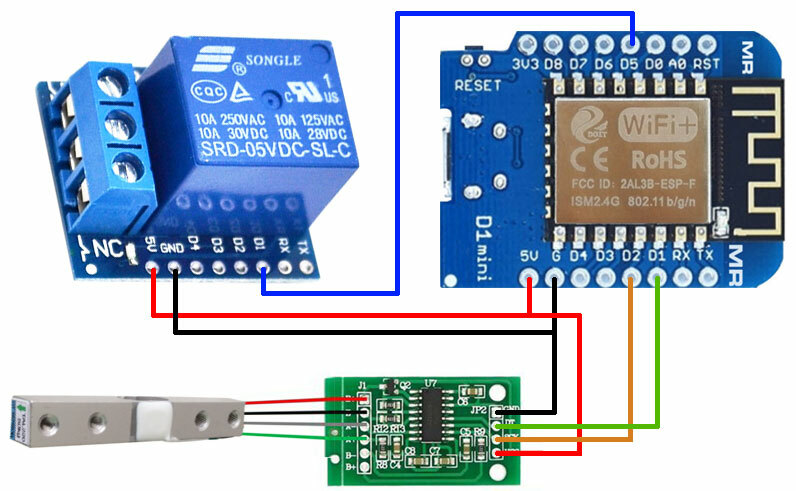 I will not publish any Arduino, Blynk or ESP8266 tutorials here, you can easily find hundres of them by searching the www. Hardware used in this project (All product links below goes to AMAZON and will help me to run this website). HX711 AD converter with built in amplifier for load cells, I prefer the shielded version. Another popular version (not tested by me) is the SparFun board. Some 100uF capacitors is optional but will increase the stability of your circuit. I put them close to the power input of each of the ESP8266, Relay and HX711 boards. A usb micro power supply to run your circuit from get a 2 amp version for better stability. + Tools but since you are here you probably already own them! int relayPin = D5;  // Change to suit your board. const int LOADCELL_DOUT_PIN = D2; // Change to suit your board. const int LOADCELL_SCK_PIN = D1; // Change to suit your board. digitalWrite(relayPin, HIGH);  // Relay ON. digitalWrite(relayPin, LOW);   // Relay OFF. digitalWrite (relayPin, LOW);   // Grinder interupt (Emergecy stop), Relay OFF. slider = param.asInt(); // Assigning incoming value from pin V11 (Slider value) to a global variable. timer.setInterval(500L, HX711data);  // .5 sek delay to unstress the server and stabalize readout on numeric widget @ V1. timer.setInterval(60L, HX711relay);  // 60ms delay ono to keep fast stop grinder response and not overshoot grinding to much. digitalWrite(relayPin, LOW); // To make sure grinder doesn't start running during boot. 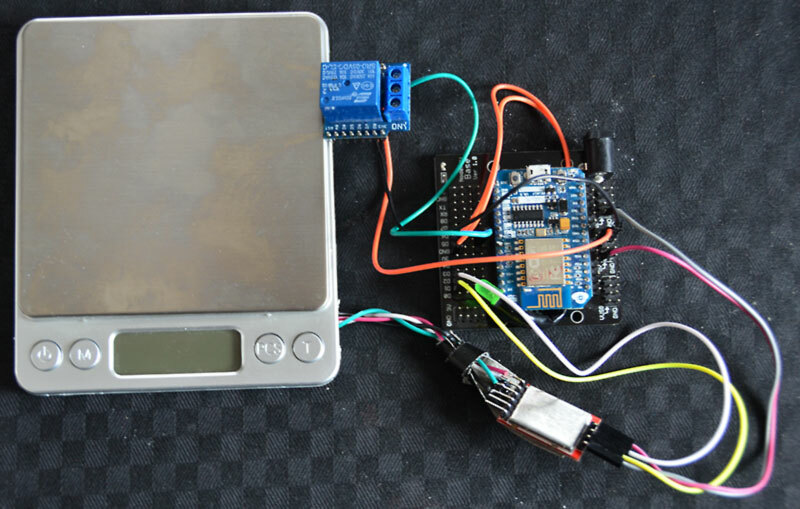 Blynk.virtualWrite(V1, scale.get_units(20));  // sending calibrated strain sensor value to Blynk value widget. digitalWrite(relayPin, LOW); //Relay OFF change the (slider-0.0) number in seconds with one decimal to compensate if grinder overshoot "Grinder calibration". My prototype setup of the weight based coffee grinder power on/off controller that actually works nearly perfect. The Blynk Android interface for my prototype I will list the elements an their settings and functions below. V1 etc stand for virtual pins, se Arduino sketch above and read the Blynk manual for further info. The “Level V” widget will fill up with color as we grind. (V1 0-100 corresponds to grams in my version). The “Labled value” Widget here it shows the preset from the slider 3. (V11 0-80 ‘or your choice’, Push). The “Slider” Widget to adjust your desired amount of ground coffee (V11 7-80 ‘or your choice’ , send on release OFF, Show value OFF, #,# for one decimal adjustments). “Styled Button” Grind (V2 0-1 Switch button) I labeled my button Grind when off and Grinding on orange background when the grinder are running. “Styled Button” Stop (V3 0-1 Push button) can also be stoped by pushing “Grind/Grinding” button when it shows “Grinding”. “Styled Button” Tare (V0 0-1 Push button) to zero scale with empty canister resting on the scale surface do this before each grinding.